except for the large background flowers, which are actual size. 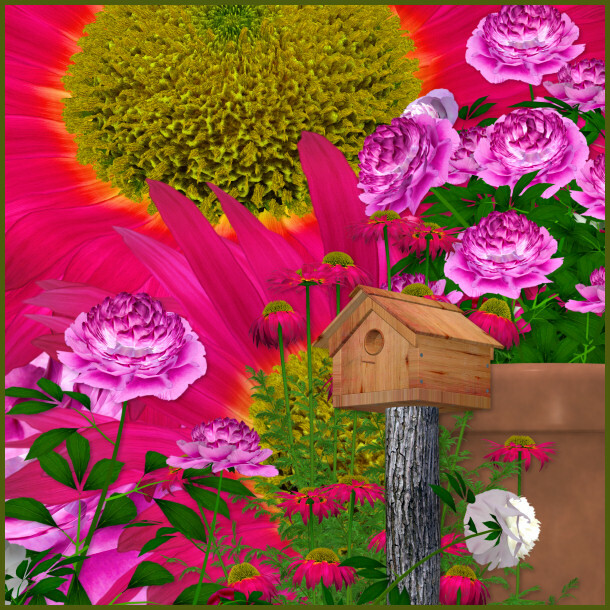 A lovely summer flower garden for your designs. 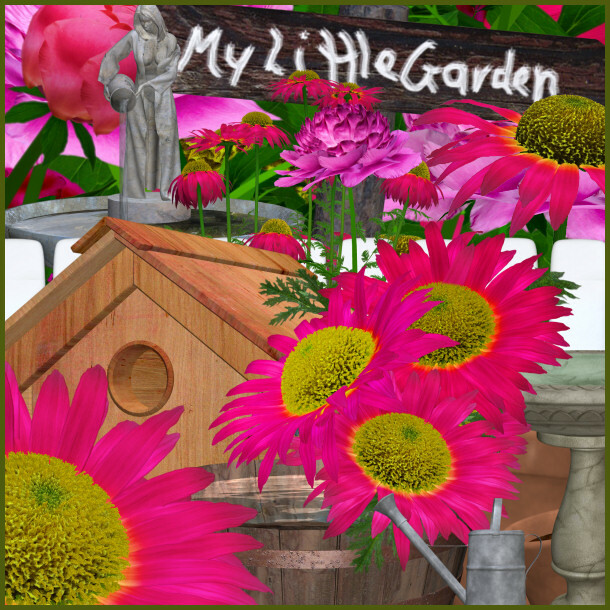 Add some pizazz to your scenes and a bold burst of color with the help of this collection of garden props, including flowers, individual blossoms, leaves, pots, barrels, birdhouses, a garden path, stones, a bird bath, fountain, a garden sign, a fence, a white gazebo (new and weathered), and more. These would be great for a scrapbook or summer print project. I’ve also included the seamless tile that I used for the background on this page. I’ve used these flowers a lot in my own designs, including my Fairy Backgrounds and Fairy Meadow Backgrounds. You’ll get a lot of mileage from them. There are 77 royalty free, high-quality clipart PNG images in this package and one seamless background tile. All of these images have transparent backgrounds (except for the background tile) making it easy for you to use them as tubes or nozzles–or merely to drop into your design. The size of these images varies, but they are approximately 800 X 2000+ pixels. All are 300 DPI, making them great for print projects. These graphics would be great for web design, template design, graphic design, t-shirt design, candy wrappers, scrapbook design, print transfers, DIY crafts, card making, embroidery designs, fabric blocks, address labels, business cards, newsletters, stationery, invitations, banners, crafts you print, paper projects, digital stamps, notelets, stickers, note cards, signature tags, and more. Please read my terms to learn more. This package is three zip files, which are about 40-58 MB each.